Buses (and dyotropic rearrangements) always come in threes. More is more: the dyotropic rearrangement of 1,2-dibromoethane. In the previous post, I discussed what we could learn from ethane by forcing it into a pericyclic dyotropic rearrangement. We saw how it voraciously scavenged two electrons from the C-C bond to achieve this. What if we give it more electrons? Thus 1,2-dibromoethane undergoing the same reaction. 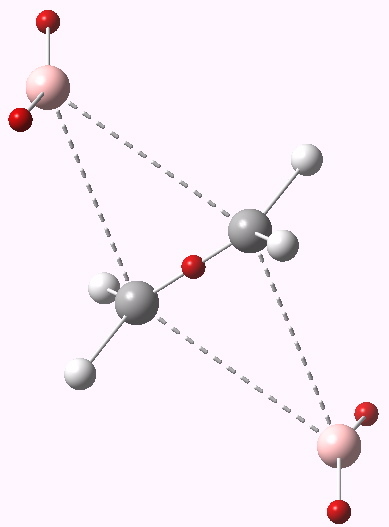 Subjected to B3LYP/6-311G(d,p) (with or without solvent field) yields a transition state with only one negative force constant. No tendency to distort from D2h symmetry then. Notice also how the migrating hydrogens did all the moving for ethane, but with a much heavier bromine replacing them, it is now the relatively light carbons and the hydrogens attached to them that instead carry the reaction. Transition state for dyotropic rearrangement. Click for 3D. What is more? Well, each Br has more valence electrons than H (7 vs 1), but of course the C-Br bond is also more ionic. Time for ELF to try to tell us what the electrons are up to. ELF analysis for the dyotropic rearrangement of 1,2-dibromoethane. This shows that the C-C region has 2.4 electrons; its actually gained some! The bromines each have 7.9 electrons in the valence shell in the form of two lone pair monosynaptic basins (and 27.5 in the core), and the remaining hydrogens on the carbon have ~2.15 each (0.15 having been ~extracted from the core of the bromine). The system has distorted from a pericyclic transfer of electrons to an ionic mechanism; an ion-triple to be precise. This is also not anti-aromatic. So here we see yet another way in which a forbidden (anti-aromatic) pericyclic reaction can distort. There are other ways still! This entry was posted on Sunday, June 12th, 2011 at 9:03 am and is filed under Uncategorized. You can follow any responses to this entry through the RSS 2.0 feed. You can leave a response, or trackback from your own site. The above post caused this crystallographer a wry smile as this mechanism for swapping the peripheral heavy atoms co-incidentally exactly matches a commonly observed disorder for this type of unit in crystal structures. Usually disorder happens more with peripheral atoms (the ones that have more degrees of freedom) but when the peripheral atoms are heavy and in the right geometry one can get situations like this where the peripheral atoms “stay still” and it is the backbone that is disordered. 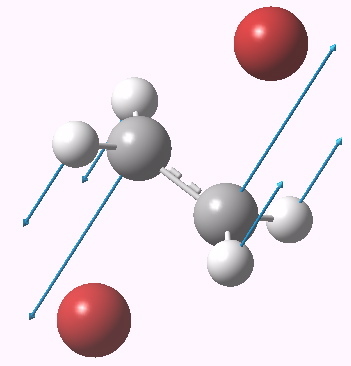 I had a recent case of a disordered 1,2-dichloroethane solvent molecule that had exactly this with one position for the chlorine atoms and two for the central ethane unit. More is more: the dyotropic rearrangement of 1,2-dibromoethane. is licensed by Henry Rzepa under a Creative Commons Attribution-Noncommercial-Share Alike 3.0 United States License.